Empires and Boundaries: Rethinking Race, Class, and Gender in Colonial Settings is an exciting collection of original essays exploring the meaning and existence of conflicting and coexisting hierarchies in colonial settings. 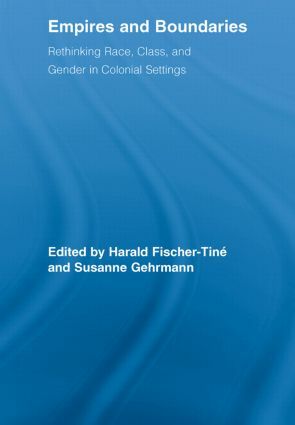 With investigations into the colonial past of a diversity of regions – including South Asia, South-East Asia, and Africa – the dozen notable international scholars collected here offer a truly inter-disciplinary approach to understanding the structures and workings of power in British, French, Dutch, German, and Italian colonial contexts. Integrating a historical approach with perspectives and theoretical tools specific to disciplines such as social anthropology, literary and film studies, and gender studies, Empires and Boundaries: Rethinking Race, Class, and Gender in Colonial Settings,is a striking and ambitious contribution to the scholarship of imperialism and post-colonialism and an essential read for anyone interested in the revolution being undergone in these fields of study. African Americans in West and Central Africa in the Late Nineteenth and Early Twentieth Centuries: Agents of European Colonial Rule?